Yesterday, L. A. River Tours (a.k.a. L.A. River Expeditions) received its tour operator license from the U.S. Army Corps of Engineers for this summer season of boating. The program will be expanded in terms of the number of people it serves, but apparently not in terms of new areas of the river, which should again be the Sepulveda Recreation Basin. The program is scheduled to run from July through September, and if the inaugural year was any example, these kayak trips will sell out in a matter of hours, although it’s estimated that the number of participants will expand from 300 to 2,000. Trips will float on Sundays and Mondays with each group averaging 10-to-12 paddlers. The cost will be $50. The Los Angeles Conservation Corps also will be hosting trips, including student groups. 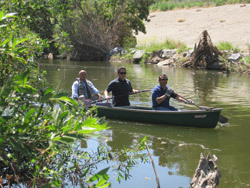 The latest info is available on the L.A. River Tours website. Now, what about a carp ‘n’ kayak? This should lead to a far greater appreciation of the resourse. Of course, when you take in the whole of the population in the immediate watershed, still, it seems a great step forward.